If someone you love has passed, and you want to honour their death as a Witch or Wiccan would do it, what do you need to know? Death can be really challenging... I know how hard it is to lose a loved one, and how important it is to have a ceremony that feels right for the situation and for all involved. Many Witches want to have a memorial service that feels true to their beliefs. And sometimes non-Wiccans want to honour the beliefs of a beloved Witch who has died. This article will address both needs. It also looks at what you can do while your Wiccan loved one is dying. WITCH TIP: In this article, we will be using the words Witch and Wiccan interchangeably, since some people like to be called one and some prefer the other. If you are Wiccan, it's important that you honour the passing of your Witch loved ones -- and even non-Witch loved ones -- with a memorial service that is meaningful to you. This helps you to find peace, and allow your loved ones to go on to their new [after-] life. Witches generally do this at Samhain (Hallowe'en), when the Veil between the world of the living and the world of the dead is thinnest, making it possible to communicate with our loved ones on the other side. But it's helpful to also perform some ritual of passing while the pain is still fresh. This can be very simple, and completely private. The ceremony below is an example. Essentially, the objective is to create an altar to your loved one who has passed, and invite them to join you there for a time. You can do this anywhere you like: a table, a windowsill, or a box covered with a cloth. Put a picture or memento of them there, and decorate it with things they loved. Definitely have a small dish of some food and a drink that they enjoyed. Have a candle, maybe some flowers. You get the idea. Then, after casting a circle, etc, light the candle and ask your beloved dead to be present with you for a while. Offer them the gifts you've brought them. Talk to them. Tell them everything you want to say, and listen while they do the same. It can be an amazing experience! In the end, thank them, and release them to their new life with blessings, knowing that the bond between you can never break, and you will be together again one day... and any time you think to reach out to them. It can be very powerful to celebrate your loved one's life with others, in some form of memorial service. There is great healing in shared grief and shared memories. This can be done at any time, whenever people would like to have a memorial service. You could also do it at Samhain (Oct 31) or Day of the Dead (Nov 2). 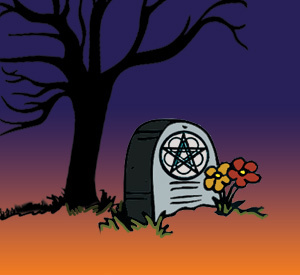 Witches generally like to meet with their beloved dead at Samhain, even if there was an earlier memorial service. For us, it's a time to reconnect with loved ones who we can't meet at other times. So if your beloved dead was a Witch, they might be hoping to see you at a similar ceremony at Samhain. If you have people you think might also want to honour the one who has passed, you can do it with them. Or if you have friends who've had their own losses, each of you can set up your own altars, and then take turns speaking of their beloved dead. This memorial service doesn't need to be visibly pagan at all. After all, every religion has some kind of ceremony like this. You can use more generic words that everyone can relate to. Set up a memorial (ie, as described as an altar, above). Ideally everyone will contribute something to it. Let everyone gather and get quiet, after the memorial is made. It is always good to sing a song or say a blessing or something that will bring everyone together. State your belief that your loved one is still with you all, in spirit, and can hear you when you are thinking of them. Let each person have time to speak, if they wish, about the beloved dead. They can share stories, happy or sad. They can say what they wished they'd said to the person, but didn't. They can share anything they like, for their own healing, for the loved ones' benefit, or for the group to share in. In the end, reaffirm that you believe your loved one has heard all of it, and that sharing of their life this way keeps them alive in everyone's hearts. That the bonds of love never break. It is also a nice touch to affirm that this helps bond all of you in deeper love, as well. Another song is good at the end, to say goodbye to your loved one and to soothe distressed hearts. If possible, end on a light note. And plenty of hugs. Assuming you are not Wiccan yourself, here's what I'd suggest. The first thing is to ask your loved one what they might need, right now. If they are not able to do this for themselves, they might appreciate someone lighting a candle for them, smudging them, or something. They may want more earthy support, like brushing their hair or holding their hand. You could let them talk about their process, their feelings, their fears and hopes. Many people find it hard to hear their loved one speaking about dying, so the person doesn't have anyone to share their feelings and thoughts with. A calm, compassionate ear can be a real gift. Finally, ask them what they want in terms of a memorial service or funeral. If others aren't supportive of their spiritual beliefs, they may need someone to help support their final wishes. This is where you can be a real ally! If you are wanting to pray for your loved one, that's always wonderful. As long as your prayers are respectful ... that is, you aren't praying for them to suddenly convert or something. We often pray for healing for our loved ones. Even if the prayer doesn't result in physical healing, it can give great comfort and spiritual healing. The benefits of prayer extend past the end of a physical life too! After death, a Witch will still benefit from your prayers. Apparently, those who've passed know when we pray for them, and say that it helps them greatly. The one thing to be aware of is that if your beliefs make your beloved Witch uncomfortable, it's best to do your praying somewhere else. When facing death, a Witch shouldn't be confronted with your feelings about their religion. This is simply not the time or place to be forcing your beliefs onto them. For one thing, it's terribly unfair -- they can't leave or defend themselves. For another, it's incredibly selfish and arrogant to think we know what's best for anyone else and try to force it on them. And death is not about those who stay behind. The dying person is the only one allowed to be selfish -- after all, if you can't be selfish on your death-bed, then where can you! When you're dealing with death, as a Witch or otherwise, be gentle with yourself, and with others who are also grieving. A memorial service for the death of a Witch -- or anyone, even an animal friend -- is mostly for those of us left behind. Everyone passes at some point. It can be hard to let go, though. It can be hard to accept the loss. You can pray for acceptance at the same time as you pray for your loved one: putting it into the hands of the Divine. You might want to read this article for a Wiccan perspective on death.